Spring is in the air, my tulips are coming up and it’s raining today. I love spring and all the beautiful colors that come with it. 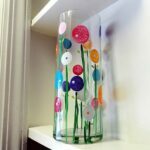 To celebrate, I made this pretty vase with simple bubble style poppy flowers all over it. Just enough color to brighten up a room or dining table, a great way to usher in the season! Poppies are also a symbol for Veteran’s Day. Here are some fun poppy crafts for kids over at Happy Hooligans! This was a project I created for Hobby Lobby on behalf of DecoArt. I used Americana’s Gloss Enamel paints, which once cured can be washed by hand or in the dishwasher (top rack). You can bake your project for a quicker curing process, or just let it sit for 21 days to air cure. Be sure to start with a clean glass vase. You can give it a rinse in rubbing alcohol after washing it to make sure there’s no residue. Simply swirl a pouncer in enamel paint then swirl it onto the vase. Repeat all over with the different sizes and colors. Add leaves and stems with your liner brush. Follow the full instructions for curing. Starting with the 1 1/4″ spouncer, twirl the spouncer sponge head around in the Razzle Berry paint. 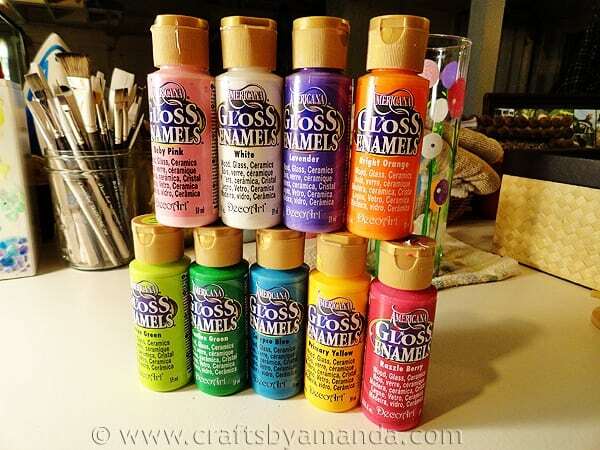 Use this same motion to apply the paint to the glass vase, creating a circle. 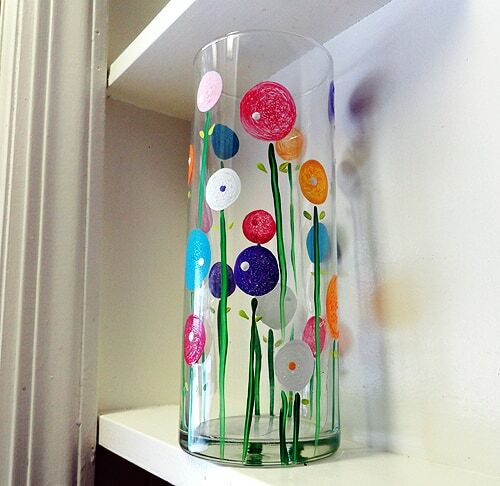 Using both sized pouncers and the different colors (except for Festive and Citron Green), create a variety of different circles all over the vase at different heights. Using the liner brush and Festive Green paint, apply long strokes from the circles downward to the bottom of the vase. Use the liner brush and Citron Green to add small leaves, two per stem. Dip the handle end of one of the paintbrushes into the white paint. Add a white dot to each colored flower, some in the center, some off to the side. For any white flowers, pick any color you choose to create the dots. 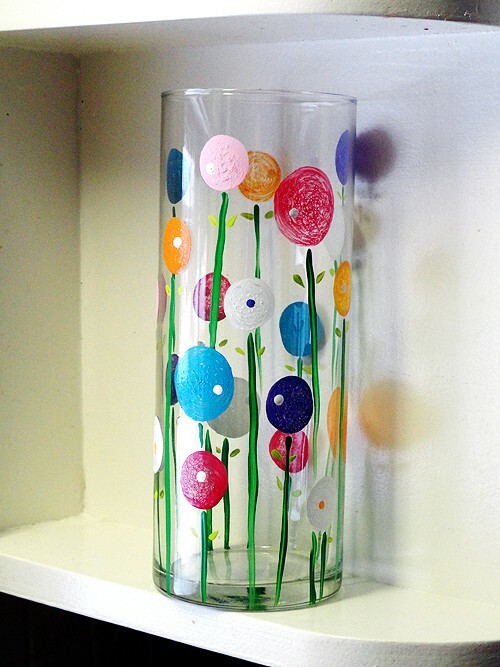 Allow vase to dry for 48 hours, then place in a cool oven. Heat oven to 325 F and bake for 30 minutes. Turn off oven, prop door oven and allow oven to cool completely before removing vase. Alternatively, you can air cure the paint for 21 days. Hola dónde puedo conseguir las pinturas para hacer los tulipanes, en Argentina. Hi Andrea. I’m not sure where you can find them in Argentina, but you could cut circles from regular household sponges instead!